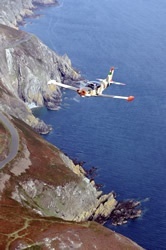 Geoffrey currently holds 24 aviation world records for speed from point to point nationally and internationally. He is well-known nationally and internationally for his air racing exploits. 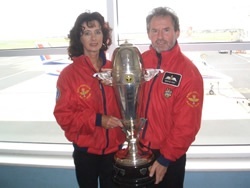 As well as being winners of the Manx Air Derby Air Race (the magnificent Troph y is displayed in the Trophy cabinet of the Departure Lounge at Ronaldsway Airport), racing with his navigator wife Suzie they have been European Air Racing Champions twice and won the Olympic Tribute Trophy held just prior to the Olympics in Greece in 2004 — all flying the Manx ba nner. They have also won the prestigious King’s Cup on three occasions and British Air Racing Championship in 2011. 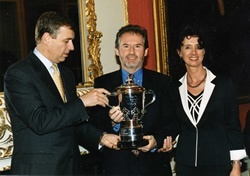 Other interests include a passion for conservation of the countryside and the environment, photography (particularly aerial photography), motorcycling, shooting, flying the Manx flag throughout the world during extensive travel and generally doing their best in terms of maintaining the environment on their farm at Ballagarraghyn in St Johns.